Today was Safer Internet Day. We joined with thousands of schools across the UK, to study the Internet and think about ways we can make it a safer place. The day started with Mr Mansfield taking some of the Digital Leaders to Glan Usk Primary for a collaborative lesson taught by Mr Geary, a Welsh Government Digital Expert. They were asked to think about ways they used the internet and how they’d feel if it disappeared all of a sudden! They were then asked to come up with their own ‘Digital Good Deeds’ to make the internet a better place. Supporting friends who had been cyber-bullied, telling adults about various online games, working together on Minecraft, teaching grandparents to use the internet and blocking unknown friend-requests on social media, were just some of the Digital Deeds they came up with. It was great to join with our friends at Glan Usk for a collaborative lesson. When we returned to school, teachers and pupils reflected on ways which they used the internet and made mind maps of their most used websites and apps. They were then asked to think of ways to stay safe online and share their ideas with each other. Some children made excellent e-safety posters, which we’ll enlarge and display around the school. 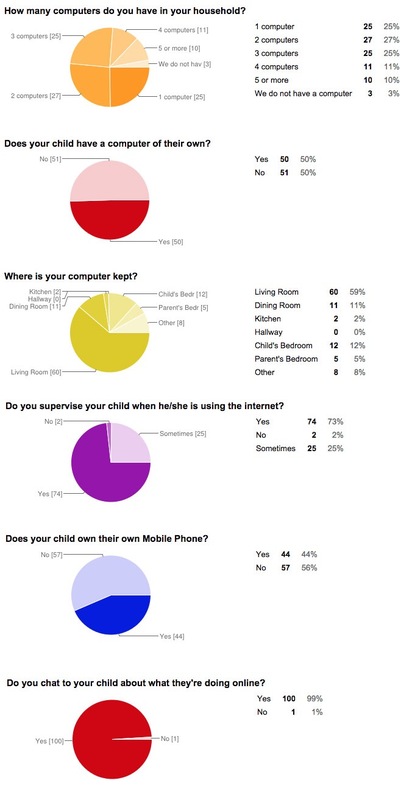 Parents were even asked to join in with Safer Internet Day, by completing a short survey about what their children do online when they’re at home. You can view some of the results by clicking the image to the right. The Digital Leaders had a really busy day, because at lunch time, they were sent on a mission with a video camera, to interview children about their internet usage. They then compiled this short video, showing their findings. The day ended with an e-safety assembly from Mr Mansfield, who talked about the most common apps and websites, the dangers of going online and also shared some top-tips for being a safe Digital Citizen. Please ask your children what they’ve learnt today and chat to them about what they do online. It’s important that they feel comfortable to talk about what they do and see in their digital cyber-world! If you need help or advice about e-safety, please feel free to speak to Mr Mansfield or click here for more information.